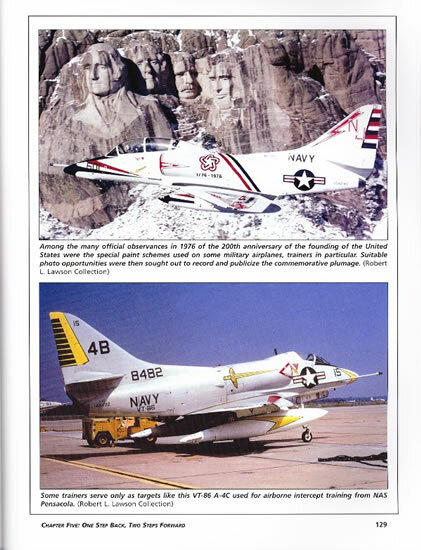 A comprehensive history of the development and service of the A-4 Skyhawk. Key points illustrated and technical drawings useful for modellers. This is a good reference for anyone interested in the A-4 Skyhawk, covering the full spectrum from design origins to development and service experience. Whilst not a specific modelling reference there is plenty of included reference material that will prove useful. This is not a photographic walkaround but there is still plenty of eye-candy interspersed in and complimenting the comprehensive and readable text. The A-4 Skyhawk is one of the classic warplanes that evolved at the right time to fulfil the needs of both its main user, the US Navy, whilst being flexible enough to provide a range of air combat capabilities for a long list of export users. A small, light-weight strike aircraft, it seemed lost on the expansive decks of large nuclear-powered aircraft carriers, but fitted perfectly on the cramped decks of modernised World War Two era fleet carriers, giving many nations a modern jet to operate from decks designed for F6F Hellcats or Hawker Sea Furys. In this new book, noted aviation author Tommy Thomason chronicles the history of the type from design definition as a light-weight nuclear bomber for the US Navy in the early 1950s to its current operation in the air arms of several South American countries. As befits a comprehensive history of the topic, Thomason assumes nothing of the reader, starting with an introduction that chronicles Ed Heinemann’s career at the El Segundo division of Douglas Aircraft. 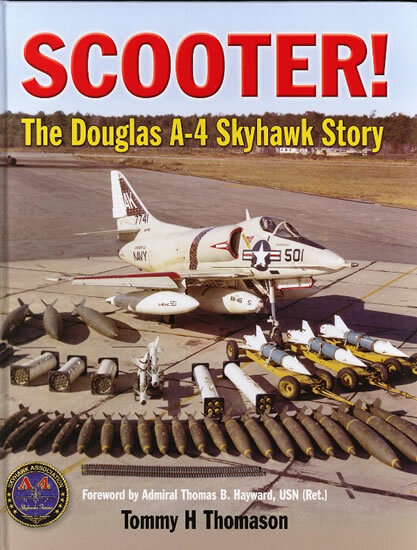 This introduction sets the scene neatly by explaining the intersection of Heinemann’s vision for small light attack aircraft with the Navy Bureau of Aeronautics requirement for a nuclear strike aircraft that was to result in the Skyhawk. The book then follows a conventional breakdown for a specific type history that will be familiar to readers of these types of aviation history books. Chapter one covers the design definition process, whilst chapter two addresses the test and development program which commenced with first flight in June 1954, with subsequent chapters covering the continuous improvement and development programs that saw various performance, weapons loads and sensor upgrades to allow the A-4 to transition from a day clear weather to all weather strike aircraft in the A-4C. After covering later developments including the later generation variants, Thomason examines the combat history of the type in US Navy and Marine service during the Vietnam War. Subsequent to this is an examination of the US Navy VA(L) competition which ultimately saw the A-7 selected as a replacement for the Skyhawk on US Navy decks despite which losing, saw Skyhawk production last until 1977 with the delivery of the 2960th airframe. 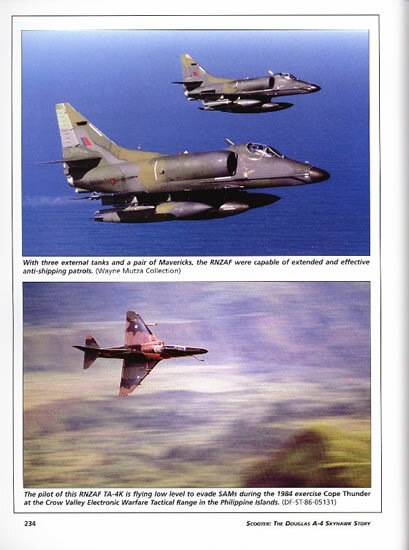 The final two chapters cover the full range of foreign operators of the Skyhawk (an extensive list of users of both new build and refurbished models) and the second line roles of the Skyhawk in US service ranging from aerobatic team mount to electronic warfare trainer and adversary aircraft. Most interesting for me in this section was the various proposals put forward by Douglas to convince operators of former Royal Navy Majestic and Colossus class Light Fleet Carriers to purchase the aircraft, including re-engining with the Rolls Royce Spey. Although these modification efforts came to naught the Skyhawk did take to some of these decks, including with the Navies of Argentina, Australia and Brazil. Having dealt with the content, my assessment of the book as a whole is very favourable. It is well presented as a hardcover book approximately A4 in size. Printing and photo reproduction is of a high quality on glossy paper and it comes across as a very professional package as would be expected from a book under the Crecy imprint. It should be noted that this book is more about text than photographs, but there is no shortage of the latter. All aspects of the Skyhawk’s design and operational history are illustrated, along with many technical drawings and diagrams covering specific areas. All the foreign operators are also well documented with a selection of interesting photographs. If however you are looking for a detailed photographic walkaround or details of colours and markings I would suggest that other volumes might be better sources or complement this book. That said there would still be a lot a modeller will get from this volume and it should be high on the wish list of those who have an interest in the US Navy or the Skyhawk.